Again I have reached for my Echo Park Summer Dreams 6x6 paper pad. 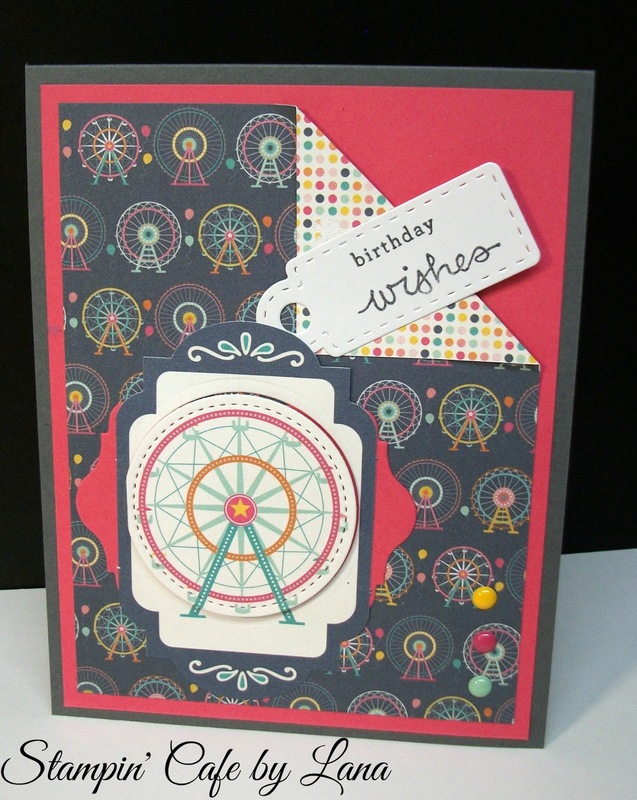 This card uses the ferris wheel paper along with the ferris wheel tag in the ephemera pack. I'm finding that the colors in this paper pad match almost perfectly my Stampin' Up colored cardstock. On this card I used Basic Gray and Strawberry Slush (a retired color). I punched out the ferris wheel from the ephemera tag and added it back into the tag using dimensionals. That tag was layered onto a tag I die cut using the Chalk Talk Framelet set from Stampin' Up! (another favorite!) I added some enamel dots to the lower righthand side in bright yellow, hot pink and light blue. Who doesn't love a ferris wheel? I think this card could also be a masculine card with the deep gray color.